The Lexicon PCM 60 Digital Reverberator is a high-performance, low-cost digital reverb designed to be used with a wide range of instruments, stage equipment, and studio mixers. It incorporates the most advanced digital audio processing circuitry available lor clean sound and extremely high-quallty reverberation. The Lexicon PCM 60’s controls are easy to use, offering flexible operation and a logical layout. Front-panel LEDs light to indicate selected functions, and a five-segment headroom indicator has been included for precise input level monitoring. 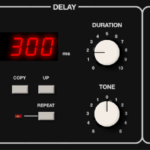 The Lexicon PCM 60 features two main reverb programs: Room and Plate. From these two programs, you can tailor reverberation characteristics on the basis of size, reverb time, and bass and treble contouring, producing a wide variety of distinct reverberation effects. Rotary knobs are used to set input gain, reverb mix, and output level. A Bypass mode switch with optional foot pedal control is included; the unit is automatically placed in Bypass mode when switched off. For compatibility with the widest range or peripheral audio equipment, the Lexicon PCM 60 has a balanced/unbalanced audio input (mono in), two unbalanced (single-ended) audio outputs (stereo out), and an effects loop – all using standard 1/4in, phone jacks. Input and output sensitivity select push-buttons on the rear panel can be set for high or low-level inputs and high or low-level outputs. This product is the result of years of study and development, its design incorporates suggestions from knowledgeable users and reflects Lexicons long experience in providing superior digital audio equipment to the professional. Every effort has gone into making the Lexicon PCM 60 perform to the highest industry standards.